When Poverty Roe studio PRC released The Monster Maker in April 1944, it was their first horror movie for almost eighteen months. 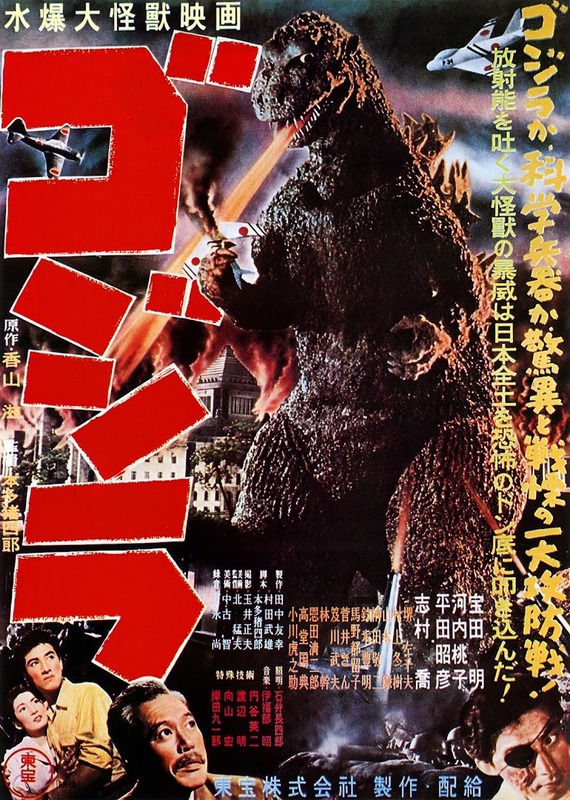 The result had better production values and serviceable performances than usual, but drags interminably in the second half, failing to utilise two standard horror components that in other hands would have jacked up the pace: a disfigured victim of a mad scientist and a gorilla on the loose. 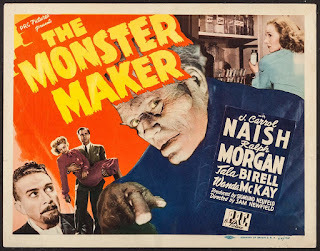 Director Sam Neufield had already given us the two George Zucco vehicles of The Mad Monster (1942) and 1943’s Dead Men Walk - both reviewed on this site - neither of which were in danger of reaching a quality threshold due to his pursuit of phenomenal credit volume over substance. The screenplay and story was down to Larry Williams, Pierre Gendron, Martin Mooney and Nell O'Day, which always beggars belief as to how so many people are needed for such meagre results. For the role of the medical megalomaniac Dr Ivan Markoff, PRC were supremely lucky to get J. Carol Naish at a point when his career was on a high. His work on The Monster Maker along with the same year’s Jungle Woman and House of Frankenstein all fell right between two Academy Award-nominated performances of his. As Italian Guiseppe in Bogart war picture Sahara (1943) and Hispanic father Charley in A Medal for Benny (1945) he made versatile use of his indeterminate ethnic appearance, which in reality was of Irish-American origin. Maxine (Tala Birell). Birell was a Romanian who came to Hollywood and was labelled like many as a second Garbo due to her remote, frosty beauty. Here, she uses this to convey a seething jealousy at having her loyalty to Markoff thrown over in favour of his unhealthy desire for this interloper. Markoff pesters Patricia with flowers and notes until Lawrence is forced to visit him to warn him to stay away. There’s an amusing hint of Markoff’s field of expertise in the reading matter Lawrence glances through while waiting, with an article headed ‘MAN IS WHAT HIS DUCTLESS GLANDS MAKE HIM’, which at least maketh the man a little more interestingly than his clothes. Meanwhile we see Markoff busying himself in his laboratory with test-tubes and that other requisite of any serious scientific cuckoo, a caged gorilla, (another opportunity for man-plus-ape-suit Ray ‘Crash’ Corrigan to earn his sideline). Markoff’s response to laying off stalking Patricia is to show an unimpressed Lawrence an admittedly exact likeness photo of his deceased wife, and then state “But I’m going to marry her” with cold finality. Understandably, protective dad Lawrence grapples with Markoff who cunningly sees a chance for an experimental guinea pig. He injects Lawrence with a strain of the disease acromegaly, the very one of which he is a world expert and for which he has been researching a cure. Acromegaly is a horrific real condition caused by excessive growth hormone produced from a defective pituitary gland, resulting in enlarged hands, feet and parts of the head. (The tragically-afflicted Rondo Hatton parlayed his extreme sufferance of the disease into a brief horror film career that we will cover – The Pearl of Death (1944) and 1946’s House of Horrors and The Brute Man). To begin with, Lawrence develops the side-effects of oncoming acromegaly, namely an excess of restless energy. His sudden, relentless ivory-tinkling concerns Patricia and her fiancé Bob (Terry Frost) while he becomes increasingly hampered by discomfort in his hands. It isn’t long before he manifests the full-blown grotesquerie of an enlarged chin, forehead and cheekbones resembling the Elephant Man John Merrick. Hiding his awful appearance from his family, Lawrence is forced to go to Markoff in secret as he is the only acknowledged authority. What Lawrence doesn’t know speaks even worse of Markoff’s dastardly deeds. The unspeakable villain had once injected his living wife the same way to prevent her beauty being enjoyed by anyone else. She committed suicide rather than live as a deformed victim. Markoff then stole the identity and life’s work of the real doctor. His mad god complex drives him to manaically relish the possibility of holding humanity to ransom over the cure - “The only living man to have such power”. This barrage of exposition appals Maxine to the point where she vows to betray him, a big mistake as he sends his gorilla to ineffectually attempt to murder her in a poorly-executed action sequence. Her German Shepherd ‘Ace the Wonder Dog’ (a blatant canine rip-off of Rin Tin Tin formerly owned by RKO) runs upstairs to help and the scene simply ends there inconclusively. Lawrence demeans himself with no choice other than to submit to “the devil’s apprentice” Markoff, who keeps him bed-ridden, cruelly offering the remedy only in return for his daughter’s hand. This relegation to invalid status for Lawrence hamstrings the second half of the film. Having fumbled the potentially homicidal gorilla, we are now left with a talk-fest between villain and captor while Markoff feeds Patricia misleading information about her father’s sanity and condition. 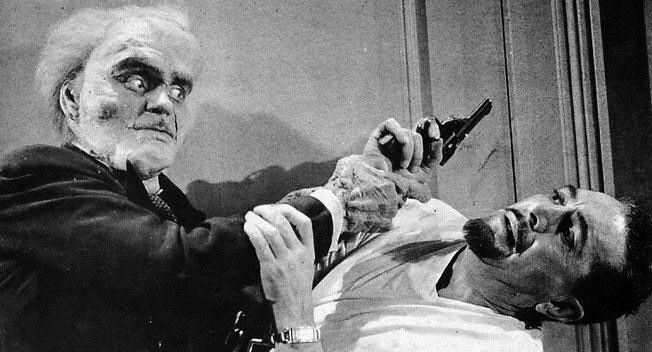 Look out for Markoff’s manservant Steve played by future horror name Glenn Strange. 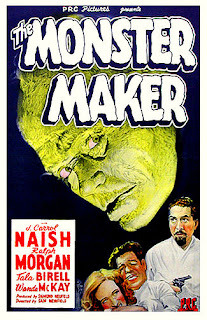 In 1942 Strange had played Petro the werewolf in PRC’s The Mad Monster. The 6 feet 5 inch-tall, 220 lb cowboy actor was being made up for another role by Jack Pierce over at Universal when the make-up supremo noted how useful his build and physiognomy could be as Frankenstein’s Monster. By the end of 1944 he would inhabit the role, beginning an association across three movies including Abbott and Costello Meet Frankenstein (1948) that was so strong that his features became those used for the studio’s wave of children’s merchandising in later decades. In this movie, he bides his time mainly opening and answering doors until a scuffle with rescuer Bob has him shot in loyal service.